I’ve been working for a couple of years now on a new book. 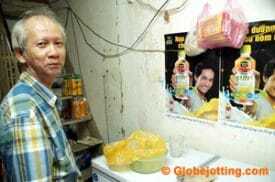 The Ghosts of Bùi Viện Street is the story of a road that slices through Saigon’s backpacker quarter. On the surface, the street appears to be a non-stop party for travelers. But dig beneath the surface, talk with the local residents and street vendors about their lives, and you discover a rich world of stories – some joyful, others tragic – in this rapidly changing neighborhood. My rough draft will be finished within the next few months. Then comes the chore of finding an agent or publisher. So it will be a while before the book is available, but in the meantime, here’s a small taste – my introduction to the book. Enjoy! Bùi Viện is a street of addictive sensory overload. Like a freakish, Asian reality TV show that’s been sifted through a kaleidoscope, it’s so colorful and strange, so wonderful and weird, you might think you’ve ingested a mild hallucinogen when all you’ve actually consumed is a cà phê đá, a hyper-potent Vietnamese iced coffee. The neighborhood’s architecture is best described as 20th Century Chaos. Buildings are squashed, side by side, so tightly that at first glance they appear to be connected; yet like blocks of Lego, they are interchangeable, easy to snap out of place with a jackhammer and a new business plan. They range in height from two to six stories, with an occasional hotel poking higher, like that lanky kid in high school who everyone said should play basketball, when in fact, he had no athletic skills. Some of the buildings are exhaust-soaked white or a creamy variation thereof. Others sport paint coats of tangerine, pastel green, cloudy blue, or rose-adulterated burgundy. They look as stable as houses of cards. 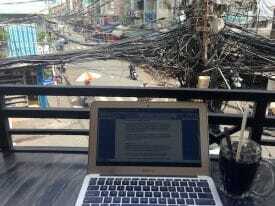 The view of Bùi Viện Street from one of my many makeshift offices. Grab a sidewalk seat at a café or a pub, and no matter how still you sit, the scenery is in constant flux. Motorbikes – not particularly big ones – carry loads that defy physics: desks, refrigerators, a dozen cases of beer, giant panes of glass, palates of potted palms, or families of six. Watching the bikes merge where Bùi Viện and Đề Thám Streets intersect is like watching a clown-car circus act. Riders zoom through the intersection 24 hours a day, prioritizing horns over brakes. There is no traffic light. In the rare instances when people do stop, it’s not until after they’ve entered the flow of oncoming traffic and are waiting in the torrent for a gap they can burst through. This intersection, the epicenter of Ho Chi Minh City’s backpacker ghetto, lies in District One. The neighborhood is named after the much larger Phạm Ngũ Lão Street, a wider, equally traffic-addled boulevard that runs parallel to Bùi Viện and intersects Đề Thám one block to the north. Phạm Ngũ Lão is the name guidebooks tend to reference when describing the area, but over the years, the action has shifted, one block over. Bùi Viện is where the real action happens. Bui Vien Street is sometimes referred to as Saigon’s “budget travelers’ ghetto,” but beneath the surface, the neighborhood is bursting with stories. Budget travelers, a largely 20-something crowd, flock here from six continents. 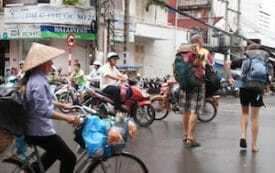 They come to explore Saigon, as Ho Chi Minh City is once again being casually called. Or they come on a stopover to elsewhere — south to the Mekong Delta’s tangled tributaries, or north to the wind-rattled beaches of the East Sea, which is what Vietnam, for political reasons, calls the South China Sea. The backpackers party in pop-up bars, where 40-cent beers are served at low-to-the-ground, wobbly plastic tables. Some stay for a night. Some linger for years, teaching English in one of the city’s array of language schools. Whether they’re short-term tourists or temporary residents, the foreigners are the reason Bùi Viện Street is what it is today. Without them, the street, as we know it, would not exist. But while these transient tourists are what fuel Bùi Viện Street, most float through, oblivious to the realities that surround them. They are not the neighborhood’s soul. There’s a second group of non-locals who come to Bùi Viện: the street hawkers. They come because the tourists come — because although the tourists who make this Saigon neighborhood their temporary home are predominantly of the shoestring-budget breed of traveler, even those tourists, whose goal is to travel on the cheap, have amounts of disposable income many of the vendors can only fantasize about. 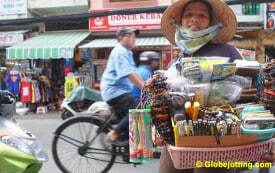 Most of the street vendors are not Saigon natives. They have come, and keep coming, to this cluttered city in search of a more stable personal economy. For many of them, the few bucks a day they pocket on Bùi Viện is more than they could earn in their rural villages. Some hawk a particular product: sunglasses, chewing gum, pirated books or DVDs, cigarettes, marijuana, hand-beaded bracelets, or animal-shaped balloons. Others sell food — peanuts, mangoes, charcoal-grilled squid, quail eggs, chicken feet, or barbecued frog. Some offer transportation on motorbike taxis. Some pilot bicycle-powered rickshaws known as “cyclos.” Many who peddle transport are also brokers of other products and services: diverse menus of mind-altering substances — pot, hashish, ecstasy, cocaine, heroin, ketamine — or nights of passion and sexually transmitted diseases with young ladies, men, and genders-in-between, who await their calls. Were it not for the tourists, the street vendors and their shadow economy would not exist here. The vendors are the second element in a triad of humanity that makes the area what it is. While many are not Saigon natives, they carve out a sense of belonging in ways tourists can’t or won’t. The vendors speak Vietnamese. They think with a Vietnamese mindset. They intersect with the tourists on a superficial level. The vendors sometimes have things that some tourists sometimes want. Finding those customers, and determining how much said customers will pay, requires casting a wide net. With no storefront to tempt people in, their only marketing strategy is to ask and ask and ask — “You buy something?” — to every person they see on this street packed with sidewalk watering holes. For many of the vendors, this approach is futile 97 percent of the time. But that three percent that isn’t, those couple of sales each day, earn them enough to afford a little rice and vegetables for their children. Then, there’s a third breed of resident along Bùi Viện: The originals. These families have lived here for multiple generations. The elder residents have survived wars and savage fires. They have watched their neighborhood struggle and grow, from a sleepy cluster of dirt roads and shambolic houses into the manic mix of crime and carnival that it is today. Most of the originals are okay with the tourist onslaught. Those who are not have left. On both sides of Bùi Viện Street sprout back-alley labyrinths, cluttered with small homes and businesses, and the neighborhood’s cheapest guest houses. Families have lived in these concrete tributaries for generations. Some, in their modest homes, have grown wealthy from the tourist invasion. Others are struggling to hang on. Turn a corner. Enter the labyrinth, and you’ll discover a different universe from the 24-7 restaurant-and-bar scene that throbs, meters away, on the main drag. Families grill lunches over outdoor hibachis, or rinse chopsticks and bowls in buckets on the pavement for nearby restaurants. During waking hours, sliding iron gates are kept open, revealing living rooms that showcase incense-sweetened shrines, oversized televisions, and family motorbikes parked inside. Like Bùi Viện Street itself, the alleys that surround it are changing, yet they feel more authentic. They still contain a living, thriving, local community. In these slices of the hood, Vietnamese residents, some of whom have lived there for decades, still hold a majority, though more and more, tourism is encroaching into these side streets as well. In contrast to Khao San Road, Bangkok’s equivalent backpacker quarter , the Phạm Ngũ Lão Ward still carries an air of local authenticity. 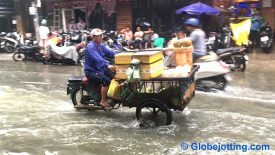 A motorbike with fresh coconuts for sale splashes through Bùi Viện Street in the rainy season. 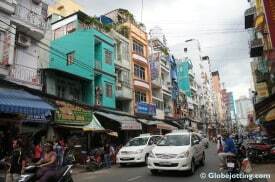 These three communities — the tourists, the hawkers, and the original residents — coexist along Bùi Viện Street in a relationship that is sometimes friendly or at least sympathetic, at other times tenuous, and in occasional moments, antagonistic. The three groups swirl in an awkward synergy fueled by complementary needs and wants, participating in an economic situation both mutually beneficial and one-sided. They operate and communicate on various levels of cultural understanding and misunderstanding — often with good intentions, but sometimes shadowed by legitimate hunger or self-centered greed. Together, they form a culture of giddy joy and troubling woe, of parties and tragedies, of goofy unpredictability and unsettling reality. Some of the characters along Bùi Viện Street have been there a lifetime. Many more are transients. Some stay only a day or two, never to be seen again. Some, like me, plan to come once but keep returning, like junkies seeking another fix, craving a head-rush of thrills, an overdose of stories. Some settle for a few months or years, calling the city home, yet in most cases never fully attaining a complete sense of belonging in the culture that surrounds them. It can be said of some of the people in this last group — and this holds true for me — that they also will never have a sense of complete belonging in any other culture. If one travels long enough, and plays in a second, third, or seventeenth world, he or she becomes a cultural chameleon, never fully fitting in anywhere, but often reveling in that fact. How long did you stay in Bui Vien? I feel like you had been here for a long time. You know the street so thoroughly. I love the lines you write about the hawkers. They’re a community and a part of the street.